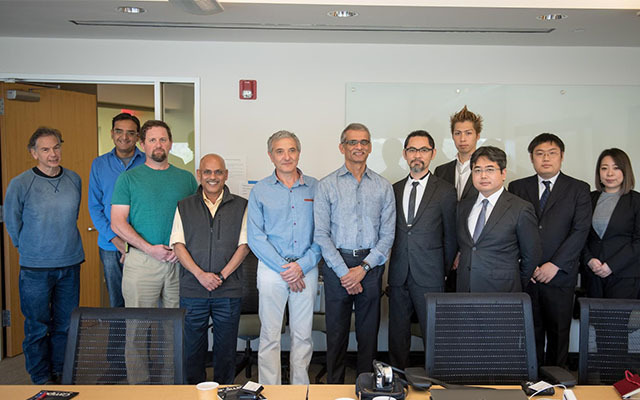 In November 2017, Cygames Chief Technology Officer, Eitoshi Ashihara and director of Cygames Research, Prof. Shuichi Kurabayashi visited UC San Diego to establish a memorandum of understanding with Prof. Shlomo Dubnov, the director of CREL, and Prof. Ramesh Rao, the director of the Qualcomm Institute so as to establish a collaboration between CREL and Cygames Research. The goal of this memorandum was to promote academic collaboration between Cygames and CREL to create an x-reality (mixed, blended, augmented reality) labs for long-term basic research and shared equipment and to provide cutting-edge content to entertain game players globally. Together, CREL and Cygames Research will collaborate to create artificial intelligence (AI) technologies that can be incorporated into Cygames’s game titles, as well as joint research focusing on mixed reality technologies that utilize smartphones and deep learning technologies for computer-generated/sound media. The collaboration will also include joint seminars and research conferences, publications and mutual visits.